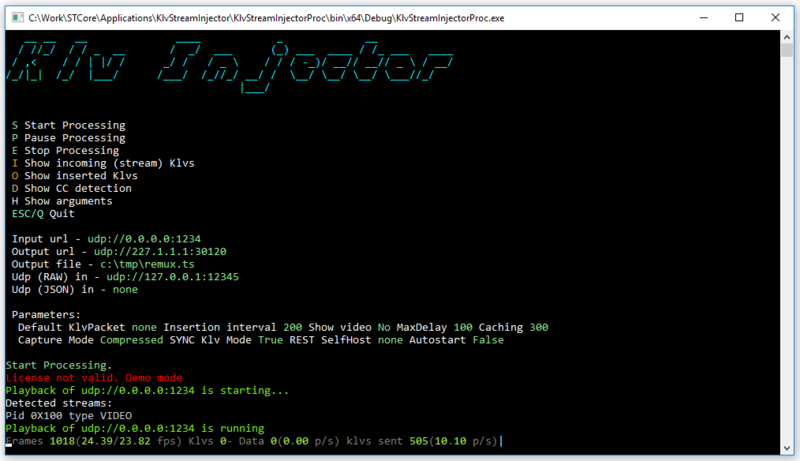 KlvStreamInjector is a command line utility that adds MISB 0601.X metadata to a transport stream sent over UDP. The metadata source can be RAW Klv or Json packets (that are encoded on-the-fly into MISB 0601 / 0102 / 0903) sent over Udp or read from file. Insert RAW Klv packets (file / UDP / REST) into TS over UDP streams. Network and file targets (simultaneous streaming and recording to file). RAW Klv insertion into TS streams. On-the-fly Json packets encoding into MISB 0601 / 0102.